DUMBARTON humbled Ladbroke Championship leaders St Mirren with a spirited performance in Paisley. 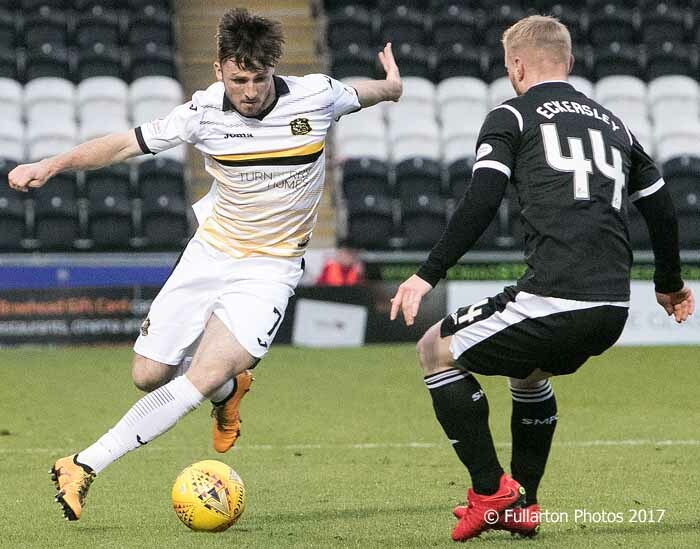 DUMBARTON humbled Ladbroke Championship leaders St Mirren with a spirited performance in Paisley in front of a 3,571 crowd. Stevie Aitken's men dominated from start to finish, but it was the 80th minute before they secured the goal their play deserved. A goalless first half in which Sons had a number of spells of attacking football ended with Stelios Demetriou being shown a red card for an elbow on Sam Wardrop. Dumbarton settled into the second period well but had to wait for the goal that would win the game. Tom Walsh, who was outstanding for the entire game, latched on to a Stuart Carswell assist to coolly slot past Samson to the acclaim of the noisy and supportive fans in the stadium's North Stand. There was a scare towards the end of the game with Sons having used all their subs, as they lost Dimitrios Froxylias with a recurrence of his hamstring injury. The picture shows Calum Gallagher getting the better of Adam Eckersley.